The Burst of Spring collection will be available in 9 days! Hey friend how are you doing? Celebrate the highly anticipated arrival of the upcoming spring season with the new Burst of Spring Collection debuting February 13th 2019! A favorite among flower enthusiasts, the delicate pansy flower is often one of the first florets to be added to the freshly worked soil as the glorious garden season arrives. The soft, velvety petals of these cheerful blossoms always invite a quick caress while being transplanted near the front of the garden bed, where they are sure to be admired by all! Awaken your senses dulled from the winter season with an enchanting and deeply hued decorative paper collection filled with sweet and amiable pansy flowers, along with whimsical fluttering butterflies! 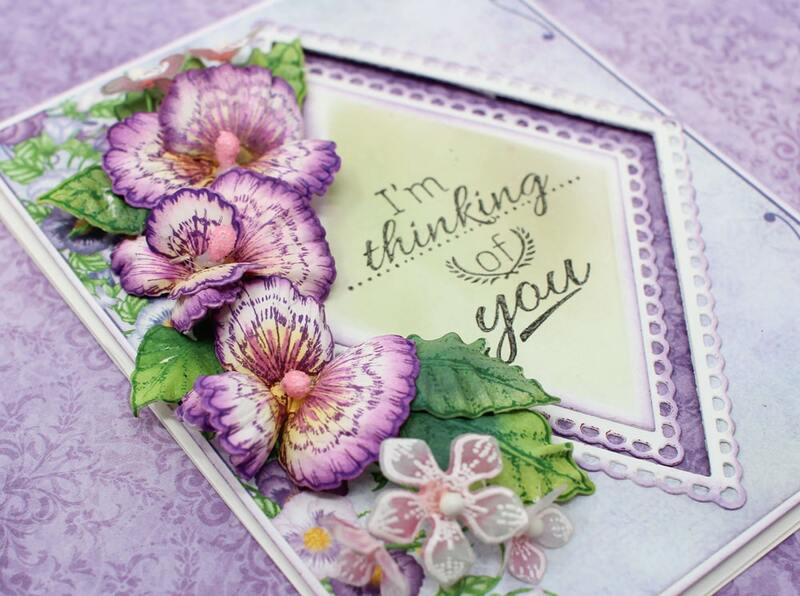 The coordinating pansy flower stamp, die, and flower shaping mold come together to create several differing sized pansy flowers ideal for creating your very own dimensional pansy bouquets as realistic as those found in the flower bed! So, join together with us in craft rooms everywhere...before the frost is out of the ground and gardening season arrives...as we anticipate and create our very own version of the appearance of spring with the Burst of Spring Collection! 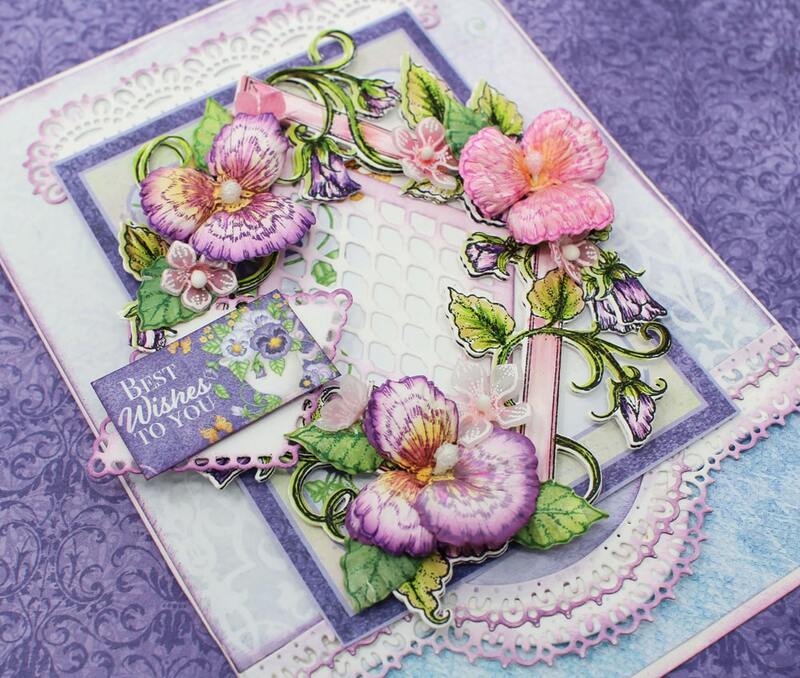 Learn more about the Burst of Spring collection here https://www.heartfeltcreations.us/collections/2019-february-burst-of-spring and add a touch of the springtime season to all of your paper craft creations! What do you love about the Burst of Spring collection? Leave us a comment below! This is one of my favorite flowers and they look so cute! I cannot wait for these! This is beautiful! Pansies are one of my most favorite flowers, and we in Ohio need a little spring right about now!!! I love pansies. So excited to see this new collection! I’ll be trying all the color variations...especially yellow with deep purple!! Thank you again, Heartfelt Creations!!! Yes..Tina....that is the one I have in mind when I think of the pansy! Pansies are my favorite flower. They represent so many beautiful colors. They make me smile. Yes, I think they are smiling flowers! They look so happy and I love all the colors they come in, they add so much color and cheer! Even better than I expected!!!! 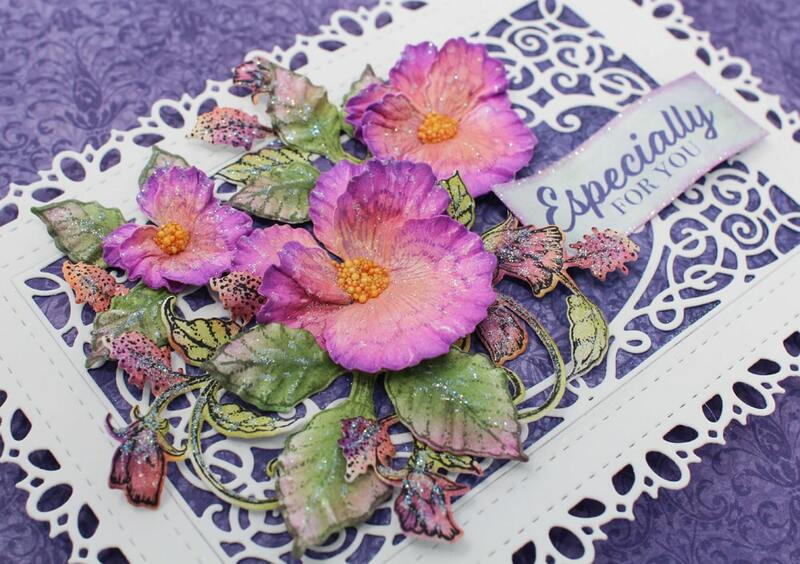 This collection will fill my long time dream to have a realistic looking pansy stamp and a whole set to boot! Thank you-thank you-thank you!!!!! So beautiful! A must have in my collection. Heartfelt never stops amazing me. This collection is absolutely stunning. I'm wishing for "Spring" more than ever now! This collection is just gorgeous!. It's my new favorite, right along with Lush Lilacs. The colours are rich and lush. The pansies are perfect for cards that will be mailed. I like to make cards that have dimension but so often they need extra postage. These pansies will give the dimension I want without exceeding postal regulations for standard postage. THANKS Heartfelt. Love, love, love this collection. Cannot wait to order! You finally did it. I’ve been waiting years for a beautiful realistic pansy. Thank you, thank you, thank you. I can wait to get mine. 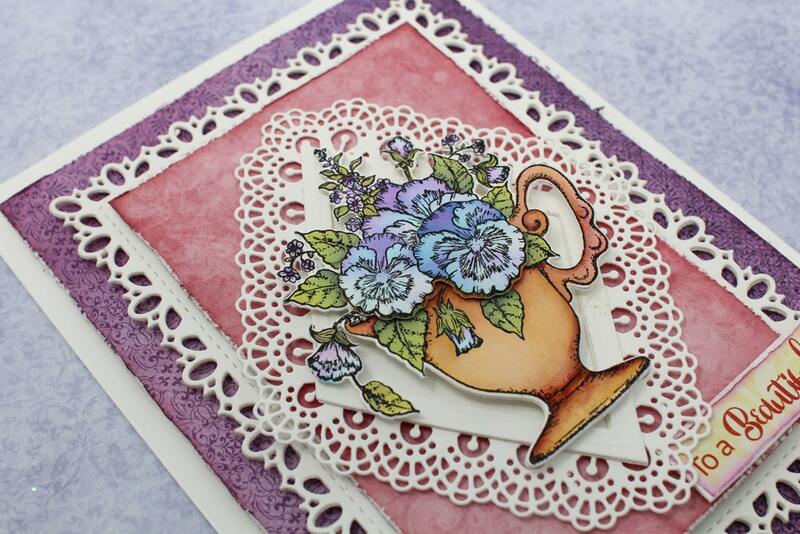 Again Heartfelt Creations another beautiful Stamp n die set. Gosh darn it! I keep saying "Stop buying"...but you've enabled me again! Pansies are one of my FAVORITE flowers! These are stunning! I can't wait to get my hands on these! Thank you for your beautiful designs and products! Top Notch! I really like that you are making the 3D shaping molds for the kits. It makes things so much simpler and prettier! What do I love about the Burst of Spring Collection ...YOU ASK ! ABSOLUTELY EVERY T HING ! as always,, it is so hard to wait to purchase ! ! This collection will bring Spring to a very cold and snowy USA! Love the corner sprays...very dramatic on a card. Looking forward to the release! Beautiful collection My Mother In Laws favourite flower. I LOVE violets i have them in my house all year long. Cant wait till they get here. Wow! Pansies are a wonderful little flowers with their sweet little faces. This release looks as if it will be just the thing for Spring! Looking forward to the release! The Pansy's. They are absolutely beautiful! 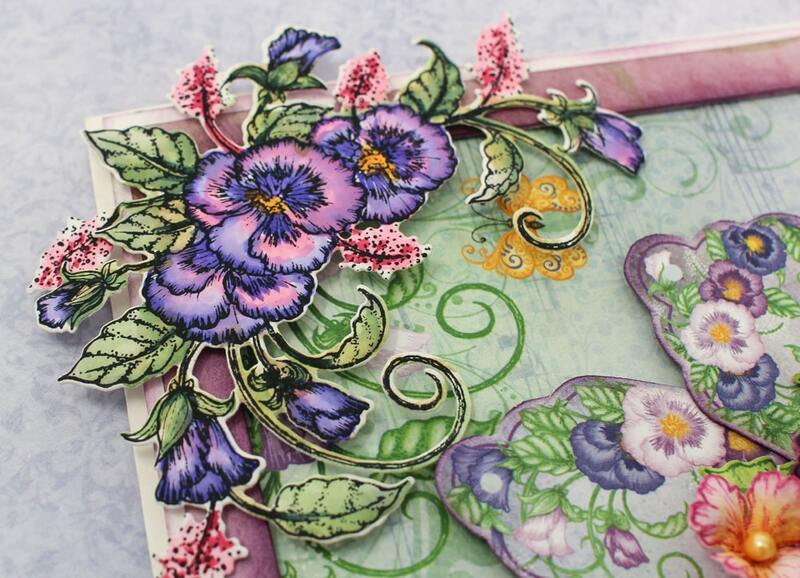 I love the unique flowers/stamps in the collection, the colors, matching paper and the awesome pansy flower shaping mold, which is a must have! I absolutely love pansies and this is a beautiful, realistic flower stamp and mold. They look so real ! I have been hoping Heartfelt would come out with pansies, one of my favorite garden flowers. I am so excited for this collection! Thank you Heartfelt for coming out with yet another lovely collection that I will enjoy using!!! Pansies are special, I connect them to my mother who is deceased. Would love to make cards with this set. Love the pansy's. One of my favorite flowers. Hope I can afford them.